The Function view lets you edit function curves and parameters. It contains a visual graph for adding, removing, and editing keyframes, as well as adjusting the velocity. The Function view allows you to display multiple functions in the background as a reference. From the top menu, select Windows > Function. From any of the other views, click the Add View button and select Function. The Function view is blank until you select the layer containing the functions you want to display. To display a function in the Function view, click on the layer containing the functions to adjust in the Timeline view. 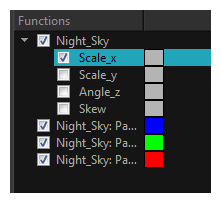 To select the functions you want to edit, select them in the Function list. When selecting a layer in the Timeline view, all the corresponding functions are displayed (if any). Select the functions you want to see and edit, and hide the ones you don't. Display Toolbar Allows you to modify how the editing area is displayed. You can hide the grid, disable the synchronization with the current frame, reset the zoom level and normalize the function display by stacking them one over the other to compare them regardless of their value range. Current Frame Displays the current scene frame. Selected Keyframe Value Displays the value of the selected keyframe. Displays the Projection, Bias, Tension and Continuity parameters to adjust the curve around the selected keyframe. 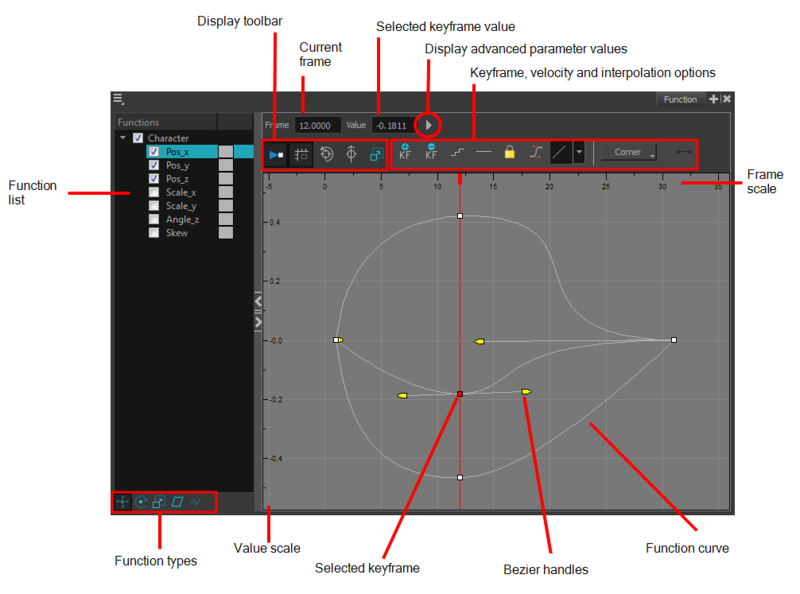 Keyframe, Velocity and Interpolation Options This toolbar lets you add and delete keyframes, adjust the velocity curve, adjust the segments to motion or stop-motion keyframes and set the velocity to create steps instead of a constant progression. Function Types This toolbar lets you click on the different function types to enable or disable all the listed functions of that type. Value Scale Displays the value range for the displayed editing area. It can be referenced to know the value of a keyframe. Selected Keyframe The selected keyframe is displayed in red. When selected, the keyframe values are displayed in the corresponding fields. The Bezier handles let you adjust the ease in and ease out of each keyframe. The more the handle is pulled out horizontally, the slower the animation will be. The more the handle is pulled out vertically, the faster the animation will be. Function Curve The thin line going from keyframe to keyframe is the actual curve. The section of a curve located between two keyframes is called a segment. Frame Scale The Frame Scale displays the frame range for the displayed editing area. It can be referenced to know the current frame of a keyframe.